Everyone says to purge and clean your craft space but what do you do with all the stuff you're getting rid of? The first inclination is to sell it and when it doesn't sell, well, you justify keeping it. And then here we are, back at square one with too much stuff and not enough space. 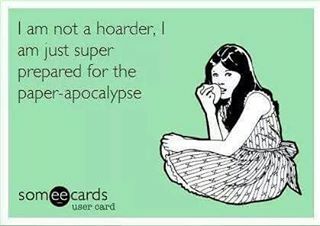 That's why I've gathered a list ways to get rid of your craft stash. Advertise your garage sale online in local Facebook groups, in the newspaper, and use signs in your neighborhood. People will expect lower prices. Invite your craftier friends to the sale and hand out fliers to teachers at your local school to get better results. Consider selling product by the box or by the bag to move MORE of it out at a time. Many craft stores will arrange their own seasonal rummage sales where 10-20 sellers bring their items to the store and sell it all together. There is usually a fee plus some stores will take a percentage of sales. They do most of the advertising and you'll sell your stuff to people looking for craft deals. Much like a garage sale, you need to advertise this yourself. You'll pay a fee for the space and may need a day business permit. The flea market organizers will let you know what is required to sell there legally. You will get people looking for deals but if you are willing to barter, then this is a great option. Many churches will have yard sales to raise money for the church. Put your stash to good use for a good cause. 5. 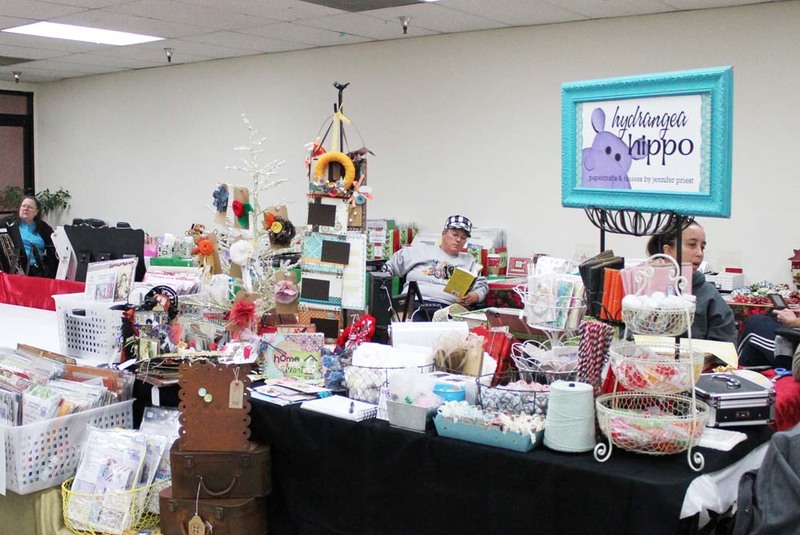 Get a booth at a crop or Scrapbook Expo and sell it off. Partner with a group of friends so you can split the fee and have a full booth. This has a pretty hefty fee for the larger events or can be free at smaller local crops. Split the booth fee among several friends to lower costs. You might also need to collect sales tax – the event organizer will usually let you know. The benefit is you have people right there at the event who want your stuff at better than garage sale prices. Set up a Paypal account, take some photos of your stuff, and put it up on your blog or website. You can be up and running in less than an hour. You will also need to add in shipping costs for orders outside of your local area. 7. Give it away. Get a receipt for charitable donations to use on your taxes. Charity Wings is a great place to donate craft and art supplies to here in Southern California. Also consider local boys and girls clubs, scout troops, teachers, day cares, day camps, and more. If they are a non-profit, ask for a receipt for your taxes. If they are for-profit, see if you can negotiate some services in exchange for your donation, such as a free week of kid's camp for $250 in supplies. 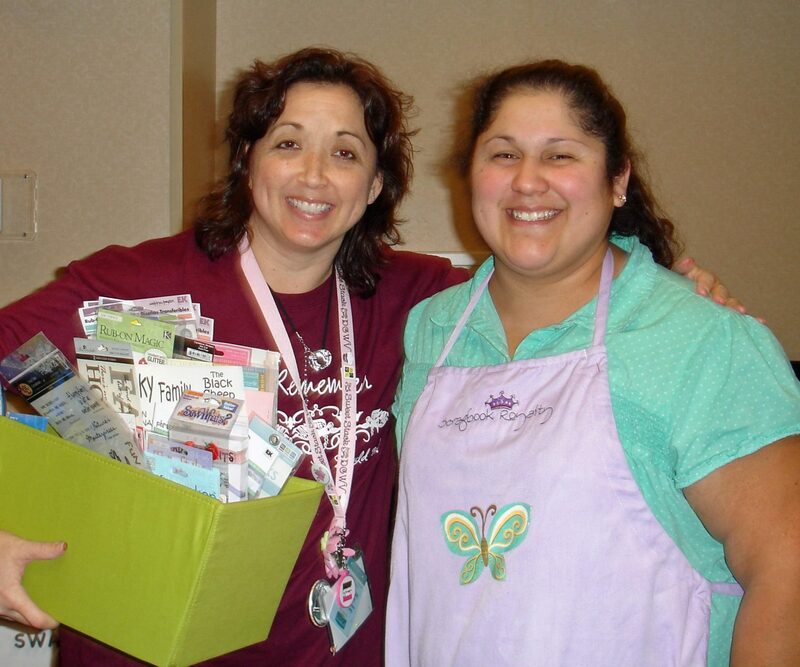 Look at that crazy old picture of me and Nan Paturzo at a Scrapbook Royalty event (now Charity Wings)! Make sure to read the terms in the group before posting – every group has different rules and guidelines to follow. Make pretty kits or sets out of things in pretty containers to sell at consignment shops. Group like things together so the package looks more appealing to buyers. Why not? Create a fun crafty activity and allow people to “shop” from your stuff. Check with your local craft store to host a class or even host a class in a coffee shop – use your stash and make some cash. List items for sale on Craig's List. You can list in the local section to avoid shipping costs. List items for sale on ebay. Be sure to figure in shipping costs, seller's fees, and sales tax. Some online forums have sections where you can sell your goods. Check the forum guidelines before posting. List items for sale on etsy. 16. Create “mystery boxes” of product to sell at a flat rate. I like to use Priority Mail Flat Rate Boxes and sell these on my Facebook Page. You don't have to post photos of the contents. Some people just post photos of a stack of boxes, ready to go. I actually made these and donated them all to Charity Wings to sell at their booth at Scrapbook Expo. They made over $800 off of them! 17. Make kits out of your craft stash to sell. If the product is still new, why not make themed kits out of it? Katie isn't in marching band anymore but I have loads of themed scrapbooking supplies for marching band. Pack it up into a kit and sell it to someone who can use it. I hope this gives some ideas of ways to get rid of your stash and still feel good about it. Getting cash money for it is good too. 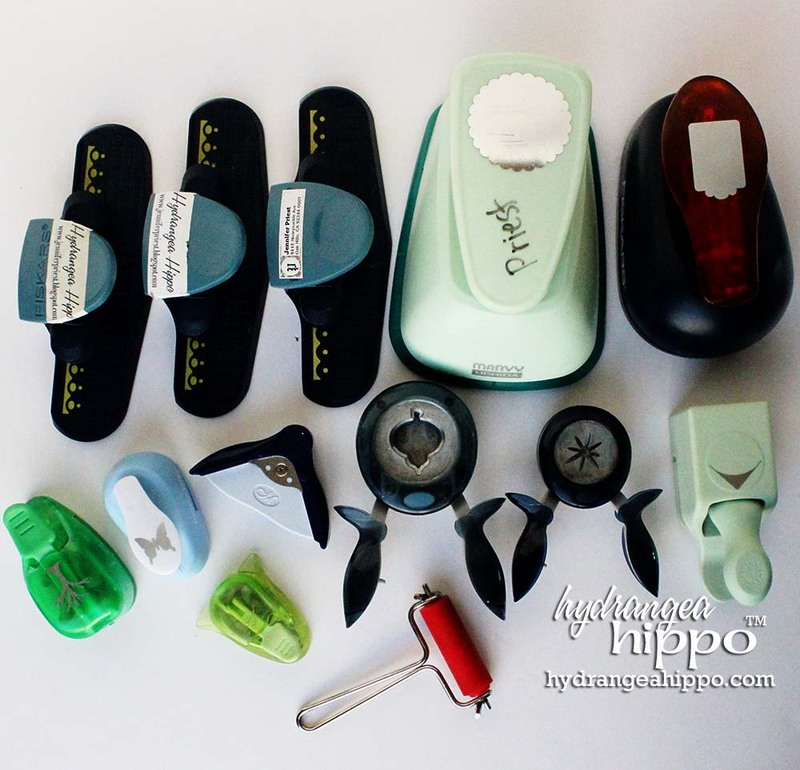 Do you have a great tip for selling your craft stash? Share it in the comments – I'd love to hear your story! Pin this list to save for later! I love these ideas! I have a pile of crafting supplies I would love to find a new home for. Thanks for sharing! Great ideas. I have done the lss ‘garage sale’. Made over 300.00. I’ll be doing it again!!!! So much to get rid of!!! Thanks for the idea about using freecyle. I haven’t heard of it before and will check it out! I love all of your suggestions. I am in the process of de-stashing a 3 bedroom house with basement to a 2 bedroom area after45 years of crafting. It is difficult to do. I love to sew and make wreaths. I have been doing costumes as a business on-line from my home. I do wreaths year round. I have been selling my fabric at yard sales an on-line. My materials to make wreaths take a lot of the space I have. Any suggestions would be helpful. I live in a small town (Ontario, Canada) and find sometimes economics dictate sales. 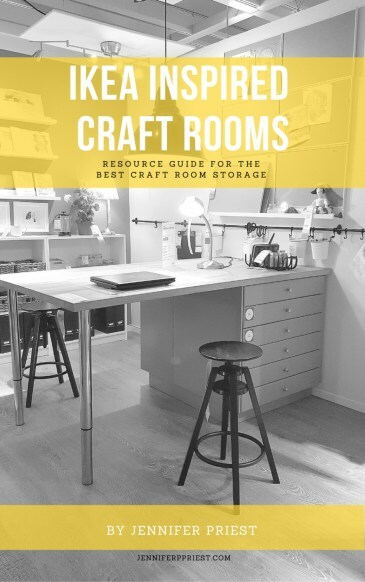 I have a craft room with over $15,000 of supplies. I want to destash, but I don’t want to give it away for nothing. I need to raise some money. What’s my best option(s)? Did you sell you stuff? If so how did you do it. I’m in the Denver area. 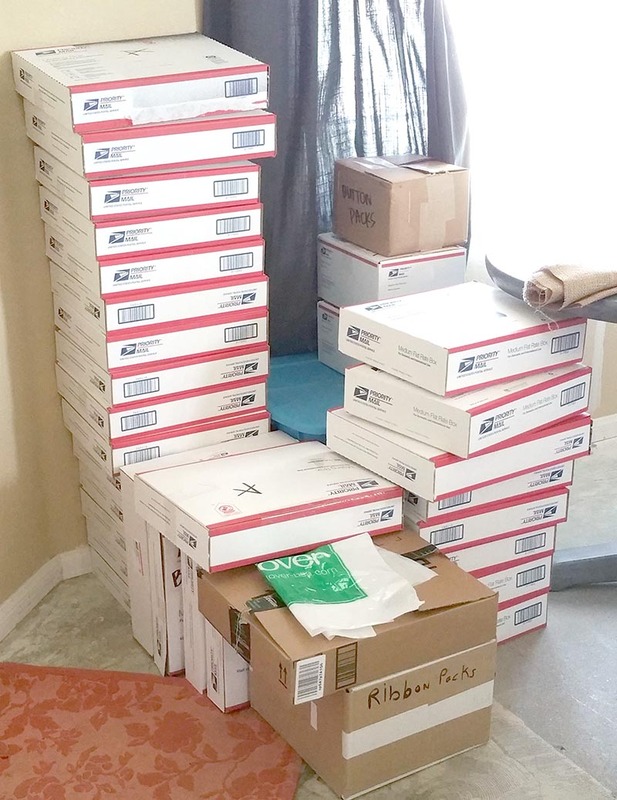 I did sell a bunch of my stuff – I used a lot of the methods I listed in this post. You can also use Craig’s List and Facebook marketplace. How do I get past the guilt over all the money I have spent on all this stuff!!!! I went through and gave away a bunch, had a garage sale and donated proceeds to Red Cross. I still have things I never touch but keep thinking I will. I won’t but I just feel so guilty getting rid of it!! The guilt is hard. Counseling can help. Also thinking about it realistically – the money is already spent whether you are storing it in your house or use it. There is nothing you can do to get that money back. But by donating, you can feel better that at least that money you invested is being put to good use. I like to think of money as energy – you are now putting that energy to good use with your donation. Those things aren’t helping anyone by sitting unused in your house, making you feel bad every time you look at them. Hope that helps!! I was a scrapper for years and ran a business online selling the items I made as a result I had a good five grand or more worth the supplies on hand all the time and eventually I merged over to digital products I designed myself and for a year all that stuff sat untouched and I was afraid to get rid of it thinking if I did I’d have to buy it all again and yet still it sat until I realized it was gonna keep sitting so I looked around for charities that use that stuff and found that the Phoenix children’s hospital had a craft program and I arranged to add a scrapbook class where they would use that stuff I donated and I also donate my time to teach it to the kids who were being treated there and the family’s they shared that experience with. The knowledge that that money went towards that even if it wasn’t intended at the time of purchase made it all worth the cost.